6: The number of times Haiyan made landfall on Nov. 8. According to the Philippine government, the typhoon made its first landfall over Guiuan in Eastern Samar before moving over Tolosa, Leyte at 7 a.m. local time and Daanbantayan, Cebu at 9:40 a.m. Haiyan then made its fourth landfall over Bantayan Island, Cebu and later made its last at Concepcion, Iloilo and Busuanga, Palawan. 17 feet:Height of the storm surge in Tacloban, the biggest city in the hardest-hit central Philippines, where some of the worst flooding was recorded. Two Americans have been identified among the dead, according to the U.S. State Department. Tim Shenk, spokesman for Doctors Without Borders, said that stems in large part from “severe logistical difficulties” preventing aid from reaching many in need of medical care or other assistance. 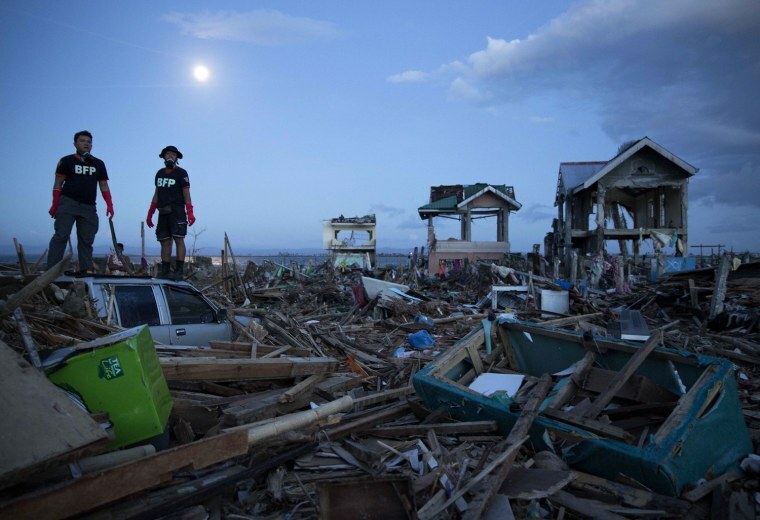 "In Guiuan town, every single roof has been blown off in a town of 45,000 inhabitants," Dr. Natasha Reyes, emergency coordinator in the Philippines with Doctors Without Borders, said in a statement. "Half of the city's hospital has been destroyed - no roof, destroyed electricity equipment, etc. It used to be a 50-bed facility with X-ray, operating theaters, everything. The wind destroyed the concrete." 400,000: The number of gallons of freshwater the U.S. Navy aircraft carrier USS George Washington can produce in a day. The carrier arrived off Samar province on Thursday, carrying with it 5,000 sailors and more than 60 aircraft, according to the U.S. Navy. Along with the carrier and its team, various aircraft were also deployed to help deliver the clean water. A barge carrying 2,000 metric tons of supplies, relief supplies, generators and vehicles shipped from Cebu City is expected to arrive on Nov. 17.